This is a preliminary analysis. Sample sizes and estimates are likely to change. A more detailed final report is being prepared for publication in a peer-reviewed journal at a later date. The Bee Informed Partnership recently conducted the twelfth annual survey of managed honey bee colony losses in the United States. This year, 4,794 beekeepers collectively managing 175,923 colonies in October 2017 provided validated survey responses. This represents 6.6% of the estimated 2.67 million managed honey-producing colonies in the nation (USDA, 2018). During the 2017-2018 winter (1 October 2017 – 1 April 2018), an estimated 30.7% of managed colonies in the United States were lost (Fig. 1). This represents an increase of 9.5 percentage points over that of the previous year, and an increase of 2.8 percentage points over that of the 10-year average total winter colony loss rate of 27.9%. Similar to previous years, backyard beekeepers lost more colonies in winter (46.3%) compared to those lost by sideline (38.0%) and commercial (26.4%) beekeepers. Backyard, sideline, and commercial beekeepers are defined as those managing 50 or fewer colonies, 51 – 500 colonies, and 501 or more colonies, respectively. Interestingly, the self-reported ‘level of acceptable winter colony loss’ increased from 18.7% last year to 20.6% this year. Sixty-nine percent of responding beekeepers lost more of their colonies than deemed to be acceptable. During the summer 2017 season (1 April 2017– 1 October 2017), an estimated 17.1% of managed colonies were lost in the U.S. This level is on par with summer colony loss estimates of 18.2% that were reported the previous year, and lower than the 20.9% average experienced by beekeepers since 2010-2011, when summer losses were first recorded by the Bee Informed Partnership. 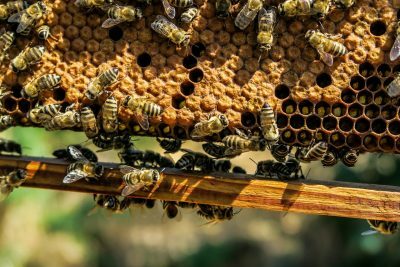 For the entire survey period (1 April 2017 – 1 April 2018), beekeepers in the U.S. lost an estimated 40.1% of their managed honey bee colonies. This is 2.7 percentage points greater than the average annual rate of loss experienced by beekeepers since 2010-2011. Fig 1. Total winter colony loss rate in the United States across years of the Bee Informed Partnership’s National Honey Bee Colony Loss Survey (yellow bars; 1 October – 1 April)1. Total annual loss estimates (orange bars) include total winter and summer (1 April – 1 October) losses; the latter has been estimated since 2010-2011 only. The acceptable winter loss rate (grey bars) is the average percentage of acceptable winter colony loss declared by the survey participants in each year of the survey. Kulhanek, K; Steinhauer, N; Rennich, K; Caron, DM; Sagili, RR; Pettis, JS; Ellis, JD; Wilson, ME; Wilkes, JT; Tarpy, DR; Rose, R; Lee, K; Rangel, J; vanEngelsdorp, D (2017) A national survey of managed honey bee 2015-2016 annual colony losses in the USA. Journal of Apicultural Research 56: 328-340. Lee, KV; Steinhauer, N; Rennich, K; Wilson, ME; Tarpy, DR; Caron, DM; Rose, R; Delaplane, KS; Baylis, K; Lengerich, EJ; Pettis, J; Skinner, JA; Wilkes, JT; Sagili, R; vanEngelsdorp, D; for the Bee Informed Partnership (2015) A national survey of managed honey bee 2013–2014 annual colony losses in the USA. Apidologie 46: 292-305. Seitz, N; Traynor, KS; Steinhauer, N; Rennich, K; Wilson, ME; Ellis, JD; Rose, R; Tarpy, DR; Sagili, RR; Caron, DM; Delaplane, KS; Rangel, J; Lee, K; Baylis, K; Wilkes, JT; Skinner, JA; Pettis, JS; vanEngelsdorp, D (2016) A national survey of managed honey bee 2014-2015 annual colony losses in the USA. Journal of Apicultural Research 54: 292-304. Spleen, AM; Lengerich, EJ; Rennich, K; Caron, D; Rose, R; Pettis, JS; Henson, M; Wilkes, JT; Wilson, M; Stitzinger, J; Lee, K; Andree, M; Snyder, R; vanEngelsdorp, D (2013) A national survey of managed honey bee 2011-12 winter colony losses in the United States: results from the Bee Informed Partnership. Journal of Apicultural Research 52: 44-53. Steinhauer, N; Rennich, K; Caron, DM; Ellis, JD; Koenig, P; Kulhanek, K; Klepps, J; Lee, K; Milbrath, M; Range; J; Rose, R; Sagili, RR; Sallmann, B; Skinner, J; Snyder, R; Topitzhofer, E; Wilkes, JT; Wilson, ME; Williams, GR; Wyns, D; vanEngelsdorp, D (2017) Honey Bee Colony Losses 2016-2017. Preliminary Results. https://beeinformed.org/results/colony-loss-2016-2017-preliminary-results/ (Accessed 20 May 2019). Steinhauer, NA; Rennich, K; Wilson, ME; Caron, DM; Lengerich, EJ; Pettis, JS; Rose, R; Skinner, JA; Tarpy, DR; Wilkes, JT; vanEngelsdorp, D (2014) A national survey of managed honey bee 2012-2013 annual colony losses in the USA: results from the Bee Informed Partnership. Journal of Apicultural Research 53: 1- 18. USDA (2018) National Agricultural Statistics Service – Honey Report. http://usda.mannlib.cornell.edu/MannUsda/viewDocumentInfo.do?documentID=1191 (Accessed May 16, 2018). van Engelsdorp, D; Caron, D; Hayes, J; Underwood, R; Henson, M; Rennich, K; Spleen, A; Andree, M; Snyder, R; Lee, K; Roccasecca, K; Wilson, M; Wilkes, J; Lengerich, E; Pettis, J (2012) A national survey of managed honey bee 2010-11 winter colony losses in the USA: results from the Bee Informed Partnership. Journal of Apicultural Research 51: 115-124.
vanEngelsdorp, D; Hayes, J; Underwood, RM; Caron, D; Pettis, J (2011) A survey of managed honey bee colony losses in the USA, fall 2009 to winter 2010. Journal of Apicultural Research 50: 1-10.
van Engelsdorp, D; Hayes, J; Underwood, RM; Pettis, J (2008) A Survey of Honey Bee Colony Losses in the U.S., Fall 2007 to Spring 2008. PLoS ONE 3: e4071. van Engelsdorp, D; Hayes, J; Underwood, RM; Pettis, JS (2010) A survey of honey bee colony losses in the United States, fall 2008 to spring 2009. Journal of Apicultural Research 49: 7-14.
van Engelsdorp, D; Underwood, R; Caron, D; Hayes, J (2007) An estimate of managed colony losses in the winter of 2006-2007: A report commissioned by the apiary inspectors of America. American Bee Journal 147: 599-603. 1 Previous survey results estimated total winter colony loss values of 21% in the winter of 2016-17, 27% in 2015-16, 22% in 2014-15, 24% in 2013-14, 30% in 2012-13, 22% in 2011-12, 30% in 2010-11, 32% in 2009-10, 29% in 2008-09, 36% in 2007-08, and 32% in 2006-07 (see reference list). Featured image is from Natural Blaze.